Beto O’Rourke, the Democratic candidate for the Texas U.S. Senate seat is being accused of pretending to be Latino by supporters of Senator Ted Cruz, a guy many accuse of pretending to be Caucasian. O’Rourke is currently representing Texas in Congress. His first name is Robert, which is where the nickname “Beto” came from, as it’s often short for “Roberto” in Mexico. It was targeted in an attack ad by Ted Cruz, whose first name is “Rafael.” Go figure. Ted Cruz is not a man of principles, ethics, or charm. His campaign also targeted O’Rourke for being likable and made fun of his past skateboarding and playing in a rock band. Whereas, any personality Cruz has is stored in the basement of the Alamo. Despite being a Republican in deeply red Texas, Cruz is in trouble. He’s seeking help from Donald Trump, a man he once called a “sniveling coward” for accusing his father of being involved in the assassination of JFK, and for making fun of his wife’s looks. Did I mention Cruz doesn’t have principles? Nobody really likes Ted. Al Franken once said he likes Cruz more than anyone else in the Senate, and he hated Ted Cruz. Lindsey Graham, a fellow Republican, once said you could shoot Cruz on the floor of the Senate and none of his colleagues would convict you. If Cruz loses his reelection bid for his Senate seat, the GOP would hate losing the seat, but wouldn’t miss Ted. You can tell a lot about a person who likes Ted Cruz. It’s a sign that you don’t want anything to do with that person. Ever watch that game show Wipeout where contestants have to go through humiliating and extremely difficult physical obstacle courses to win the prize? The players are always getting knocked down, punched in the face, and knocked into a great big muddy pool. It’s a really cool show to watch if you’re drinking in a bar and the bartender won’t change the channel. Nobody watches that kinda stuff at home, or anything on that TruTV channel. I drew a cartoon similar to this a few years ago that’s somewhere deep in my archives. There was an obstacle in front of an abortion clinic and I believe there were rattlesnakes and barbwire among the hazards. 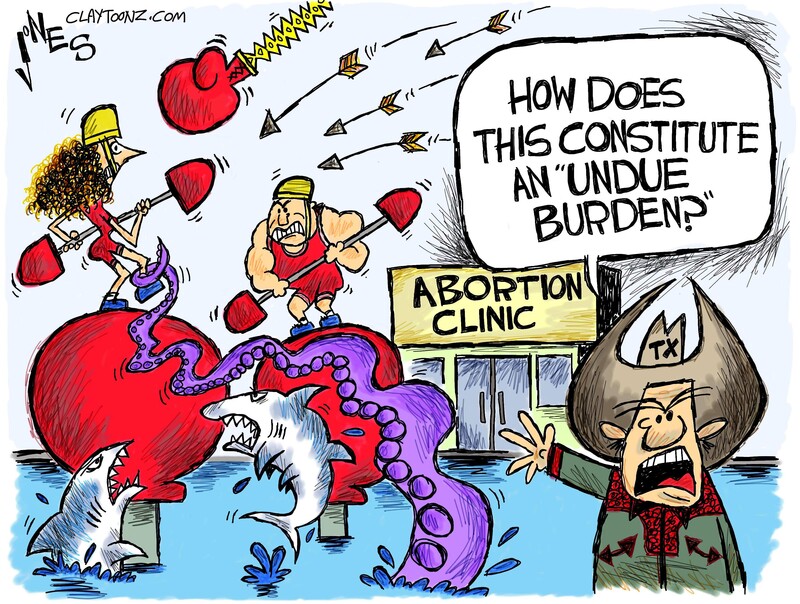 Ever since the Supreme Court ruled abortion constitutional in 1973 Republicans have been trying to find ways to circumvent a woman’s right to choose, especially in red states. Some of the obstacles they’ve constructed have been no public funding, no coverage of insurance, state-mandated counseling, licensed physicians, waiting periods, and making a girl call mom and dad. Texas got real creative. They created a law requiring doctors to have admitting privileges at nearby hospitals and clinics to meet the standards of ambulatory surgical centers. These laws were closing clinics thus making fewer of them in the state and forcing women to driver farther from home, sometimes to another state, to get an abortion. Republicans claim these laws are for women’s health. 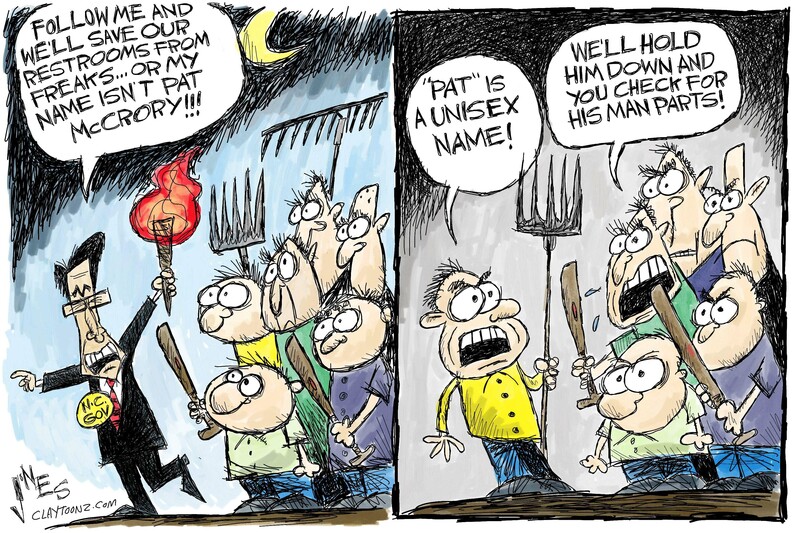 Republicans being concerned about women’s health is laughable. Republican Senate refuses to fill, ruled Texas guilty of doing. Several other states have also made ridiculous laws on abortion and we can expect many of those to be struck down soon. Republicans love to create obstacle courses for abortion, minorities registering to vote, immigration, getting on welfare, poor kids eating lunch, etc. The only issue it seems they want a clear path toward is buying a gun. I think there should be Wipeout obstacle courses for Republicans before they can enact ridiculous laws. If nothing else it would be amusing to see them land in the mud. Wallowing in the mud is where they are the most comfortable.